Ultimate Fighter season one winner Diego Sanchez wanted nothing more than to fight in front of his hometown crowd at the upcoming UFC Fight Night show in Albuquerque, NM and now he’ll get his wish. 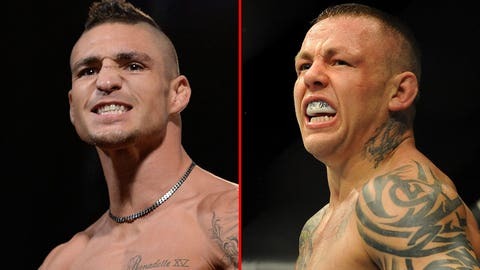 Sanchez will face off with fellow Ultimate Fighter winner Ross Pearson when the two lightweights battle it out at the upcoming show on June 7 in New Mexico. Ever since his unanimous decision loss to Myles Jury at UFC 171, Sanchez has been lobbying for a chance at redemption while also gunning for a spot on the upcoming New Mexico card. For many years, Sanchez was New Mexico’s brightest shining star in MMA as one of the original members of the team founded by coaches Greg Jackson and Mike Winkeljohn. Now he’ll go home with victory on his mind and a chance to make Albuquerque proud. Opposing Sanchez at the UFC Fight Night card will be British banger Ross Pearson, who returns to action for the first time since he suffered a no contest decision against Melvin Guillard after taking an illegal strike to the head that resulted in a nasty cut that doctors deemed too deep to allow him to continue. Since moving back to lightweight after a brief journey at 145 pounds, Pearson has gone 2-0 with the one no contest with both victories coming by way of TKO. The two lightweights will battle it out on the main card of the upcoming UFC Fight Night card headlined by former champion Benson Henderson taking on Rustam Khabilov in the five-round main event.